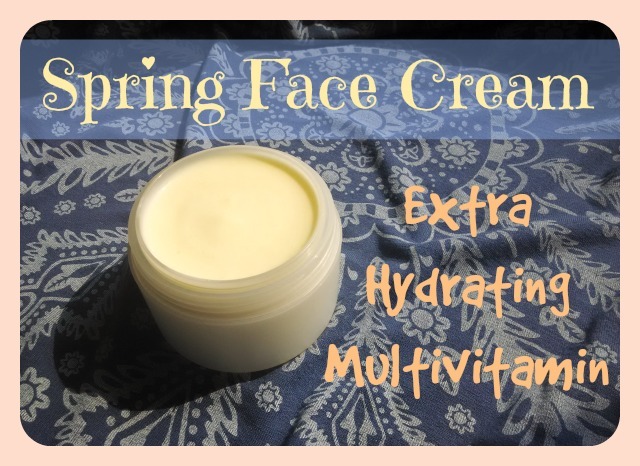 I have here for you a new recipe for a great spring cream! I really fell in love with it! I have used for the first time a “new” xanthan gum, let’s say an improved version which wouldn’t make a too slimy gel, as it usually does. I have used it so few times that I don’t feel I can have a full opinion of it but all I can say at the moment is: yes, it doesn’t make a slimy gel but, at the same time, it doesn’t gel as much as the other (normal?) xanthan gum would. So I feel I have to use it few more times to find out at which concentration I am satisfied with its gelling abilities. Finally the final step of making creams! Phase A contains the water soluble ingredients which won’t get spoiled by heat, Phase B contains the fats, the emulsifiers and the oily soluble ingredients which won’t get spoiled by heat… now it is time to talk about the most interesting PHASE C! – active ingredients (those ingredients full of good properties which would get spoiled if heated up to 70°C) usually, added all together, their percentage won’t go over 10%. Active Ingredients deserve a longer talk, obviously, mainly because there are tons of active ingredients and each has their own percentage of use. But what are Active Ingredients? They are those ingredients which give a specific value to the cream. Usually their percentage is not too high in the cream: there are specific concentrations needed for every active ingredients and whenever you purchase one, you should get the information of the percentage to use in a cream from the seller; for example Coenzyme Q10, also known as ubiquinone, should be added to a cream around 0.1% which is a very very low percentage if you think of it this way… but it is enough for its efficiency (just for the record: Q10 is of a very strong orange/yellow color and even the 0.1% will add a yellowish color to your cream; if any commercial cream which is said to contain Q10 is shining white, well… maybe it will contain the 0.01% of it 🙂 ). There are tons and tons of active ingredients. Obviously I will make singular posts about the most easy to find and interesting ones. New active ingredients get out on the market everyday trying to create new needs to us. Sometimes you can find that the “liquid Q10” is nothing else than “water, some oil, some emulsifier, Q10” which means that the Q10 is not pure (and probably at less of 0.5% of what you are buying)! So be aware of what you buy, read the ingredients of everything, be sure of the composition of everything you buy. Now back to our Active Ingredients! Here is a little list of Acid and exfoliant ingredients: alpha-lipoic acid (mostly actually famous as an antioxidant), azelaic acid (good for acne prone skin), citric acid, ferulic acid, vitamin C (ascorbic acid), glycolic acid (a very famous exfoliant, and I add that it may also be very dangerous), lactic acid (it can also be used as a main active ingredient in a cream, but often it is used only in a matter of one or two drops to make the pH go lower), malic acid, mandelic acid (a light exfoliant), retinoic acid, salicylic acid (very famous for acne, can be very dangerous if used improperly). Antioxidants – these are the active ingredients which work as antioxidants: keep in mind that many antioxidant ingredients work better in a synergy with each other (this means that if you want to make an antioxidant cream, you should add different kinds of antioxidants to the cream formulation)! To make it sound very easy: if two antioxidants separately have “power 1”, if you add both to the cream, the cream will have “antioxidant power 3” 🙂 something like this. Some antioxidants can be: Coenzyme Q10, alpha-lipoic acid, gamma oryzanol, vitamin C and stabilazed formulation of vitamin C (magnesium ascorbyl phosphate, sodium ascorbyl phosphate… there are also new formulas! ), tocopherol or tocopheryl acetate (vitamin E), gluconolactone, carotene, resveratrol, lycopene, bioflavonoids. Active ingredients good for oily skin – azelaic acid (it also helps against acne), niacinamide (it is used at percentage which changes from 1 to 4% and it is very effective to some skins while, for others, it might result too aggressive, therefore start using it at a low percentage and see how your skin reacts: keep in mind that with niacinamide in a cream the pH has to be 5-5.5 and it never has to go over 7. Also, a cream with niacinamide should be kept far from eyes and lips), glycyl glycine (difficult to find and quite expensive but it help contrast the action of oleic acid into our sebum. Oleic acid seems to be responsible also for dilating the pores. So… this is a good ingredient 🙂 ), aluminum starch octenyl succinate (this is a very fine powder which helps the skin to not shine). Hydrating – Humectant – when emulsifying water and oils you already create something “hydrating” but here are some active ingredients which give an “extra boost”: allantoin (soluble in water at 0.4%. Can create some problems in creams), Collagens amino acids: lysine, proline, glycine, glycerine (very highly hydroscopic, but it is mostly added in Phase A to help the xanthan gum in opening up), hydrolized silk/milk/oat proteins, sodium lactate, trimethylglycine. Soothing Ingredients – my two favorite and, for me, most easy to find are: allantoin (also hydrating active) and bisabolol (a derivative of chamomile, has to be added at 0.5%, it is also good for acne skin because it has a anti-inflamatory and anti-bacterial action). Another very effective one is Glycyrrhetinic acid but it may be slightly difficult to use; panthenol (Vitamin B5) can be used up to 2%. Whiteners – these ingredients can help in case of pigmentation of the skin. Kojic acid (it is an acid, so pay attention), Vitamin C, niacinamide, arbutin (used at 2%). Vasoprotector – for example these are good in case of blue ender eye circles: escin, rutin. Anti-aging ingredients – as you can imagine these, together with antioxidants, are those where the market is giving its “best” inventing new needs everyday and trying to cheat (also) 🙂 these are some good active ingredients: ceramides (there are many kinds of ceramides, it is not just one, so bear this in mind), phytosterols, ginseng extract (I will talk about different kinds of extracts in future), betaglucan, centella asiatica, plant stem cells, soy isoflavones, Phytosphingosine, viper serum (difficult to find), zanthalene (another active which works similarly to the viper serum), hyaluronic acid (actually it might be more hydrating than anti-aging… but let’s leave it here). Anti-cellulite and anti-under-eye-bags – since, as it seems, cellulite is mostly connected with water retention and bad blood circulation, the active ingredients which are good for fighting cellulite happen to be the same which are good also for under-eye bags. Obviously, the percentage in the cream will be different (unless you want to burn your under-eye area 🙂 ). Here we go: caffeine (one of my favorite active ingredients! Used up to 2% for eye creams and 3.5% for anti-cellulite creams), escin (percentage is 0.5%-1% for eye creams, up to 1.5% otherwise), fucus dry extract, theobromine (this is mostly against cellulite, I never heard of using it against under-eye-bags).